KIRUHURA – Shocked gripped residents of Rwebitete village on Akageti trading centre on Mbarara -Lyantonde road when a Fuso truck lost control and overturned killing the driver and three passengers on board instantly on Monday morning. 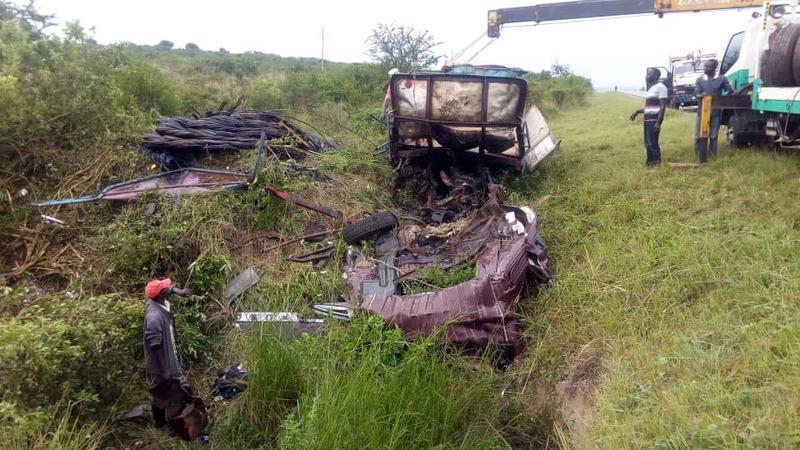 Samson Kasasira the Rwizi region police spokesperson confirmed this accident, he said that it happened at around 5 am in the morning when a Fuso lorry registration UAV 292W which was heading to Kampala, overturned after losing control killing four people on spot including the driver. Kasasira revealed on phone interview that the bodies were not yet identified but have been taken to Lyantonde hospital pending postmortem. Meanwhile, in another development, panga wielding men last night attacked the home of Philbert Mujuni aged 30 years a teacher at Nice Parks Primary school cut him into pieces to death before his body was dumped in a farm in Rwobuyenje, Migamba cell in Kakika division Mbarara Municipality. Kasasira said that police homicide unit was tipped off, visited the scene and found the body of Mujuni had panga cuttings on the arm and head He added that the body has been taken to Mbarara Regional referral hospital for postmortem and that so far police has managed to arrest one person.